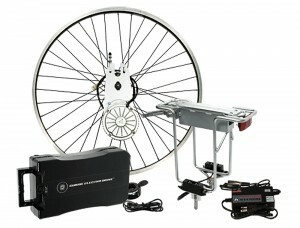 The Currie Technologies Power Kit is a great entry level electric bike conversion kit although not the highest performance on the market, for the price you get a great kit that gets you rolling easily. The Currie Technologies power kit offers a 10-15mile range depending on weight and terrain and a maximum speed of around 15mph. This style of kit has a motor that bolts onto the frame just near the rear wheel with a chain and sprocket that drives the rear wheel. They are using a high quality lead acid battery which don’t quite give power to weigh ratios like the Lithium Ion batteries give, but for less than half the price it can be a great way to start your e-bike addiction. After installing this kit it can be a good idea to carry a few spanners and allen keys to make sure all the bolts are secure. After a few days of use everything tends to settle down and you should be able to have several years riding with out having to tinker too much. Many have said this conversion kit is one you can setup then just forget about, no need to keep tinkering or fixing it, just ride. This kit is possibly slightly more difficult to set up than the front wheel in-hub bike conversion kits but there is something nice about having the back wheel powered, and gives you good traction on steep slippery roads. There have been some complaints about problems with the throttle on this model with various symptoms, either just not going or sticking on. Although it sounds as though there have been relatively few issues like this. The weight of the battery compared to what the lithium batteries offer tends to be another complaint from some owners, which is an issue if your batteries go flat but with the power the weight can hardly be noticed, and at less than half the cost of what a lithium kit would cost and a couple of kilos extra, this kit is well worth considering. Best suited for mountain bikes with 26′ rims and no rear suspension and without rear disc breaks. Although with a little mechanical know how it is possible to fit this kit to most bikes. Currie are one of the leading producers of e-bikes and electric bike conversion kits, this is one of their entry level kits but still offers excellent quality and performance. If you want a high performance bike with all the bells and whistles this one is not for you, but if you are after a cheap solid performer with out having to continually tinker look no further. hi i own a currie e-bike kit that i got last month in may and i enjoying it i order from e-bay brand new. Copyright © 2019 Electric Bike Conversion Kits.